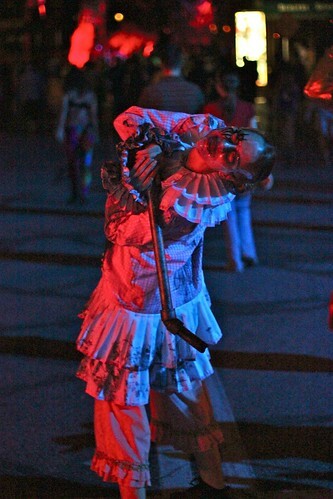 In place of scare zones, the streets of Halloween Horror Nights 2012 at Universal Orlando are haunted by the Legions of Horror, roaming the entire Universal Studios Florida theme park, scaring guests from every dark corner. But while the all-new street experience for this 22nd year of the event initially sounded novel, over the past few weeks event attendees have loudly voiced their concerns that there isn’t as much street activity as in the past and simply not enough outdoor entertainment. 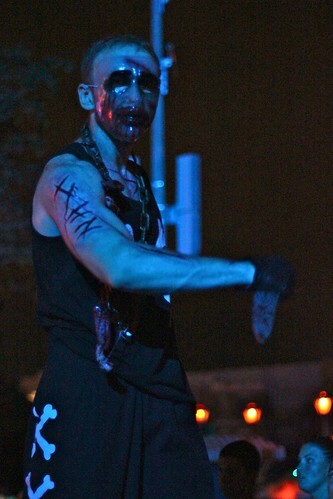 As the days draw closer to Halloween, Universal Orlando responded this past weekend with the introduction of two additional high-energy Dark Legions, coaxing screams out of guests passing through specific areas of the park. One group of characters features trick-or-treaters from an era gone by, each wearing a different simple costume, but united by creepy clear masks across all their faces. 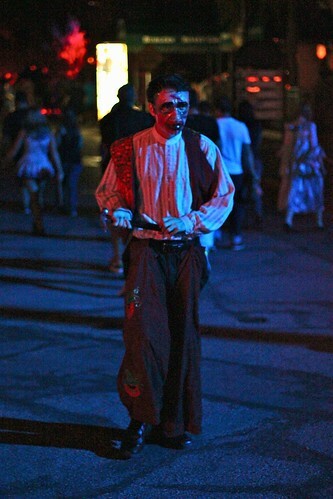 The other group adds fast moving zombies, climbing, running, growling, and waving disembodied limbs at all who pass by. 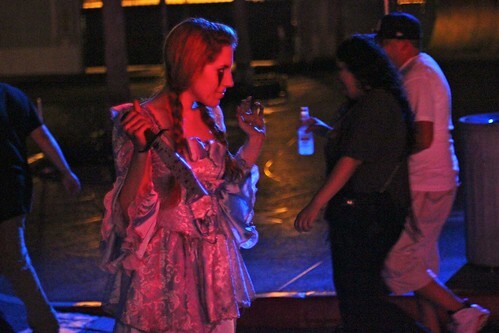 Universal’s goal in doing away with specifically placed scare zones was to give the impression that nowhere in the park is “safe” from lurking ghouls. But in practice, the theme park is a big place, leaving many gaps between the groups of Warriors, Prisoners, Beasts, Vampires, and Traditionals that roam alongside The Iniquitus, a group of scary skeleton-faced creatures that have resurrected the other Legions from their eternal slumber. 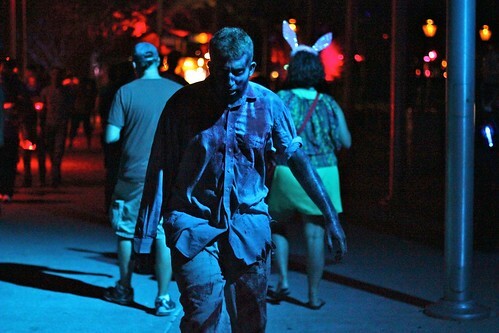 The only set scare zone this year is connected to the popular haunted house themed to “The Walking Dead,” with a group of “walkers” – relatively slow-moving zombies – pacing around the area outside the “Disaster!” attraction entrance. The addition of more actors and more street characters is welcome, even if the new characters aren’t exactly based on months of careful design. The zombies are said to be something out of films like “28 Days Later,” which move far faster than traditional George Romero-style undead creatures. 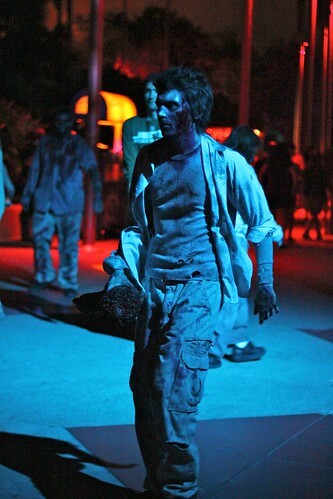 This new hoard of zombies can be spotted outside the International Food and Film Festival restaurant, close to The Simpsons Ride. But they rarely stop moving, loudly grunting their way through the crowds, making sure to invade the personal space of everyone passing through, even those eating at outdoor tables. 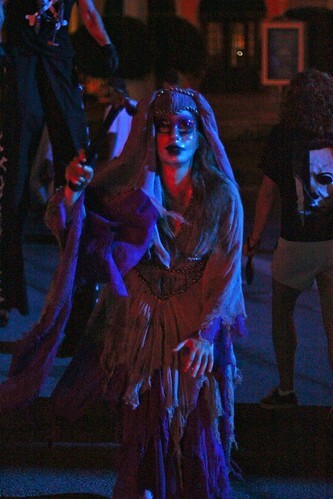 In front of Mel’s Drive-In (or “Die In” as the sign reads during Halloween Horror Nights), the new group of trick-or-treaters shouldn’t be confused with the Traditionals. Though the two concepts are similar, the new group isn’t carrying bright orange Jack-O-Lantern candy buckets or wearing animal masks like the Traditionals, instead sporting a bizarre assortment of rather ordinary and stereotypical outfits, including a cheerleader, Aladdin-style Arabian costume, a sailor, a colorful Mexican-style getup, and other costumes that seem as if they were just pulled from the costume rack backstage. 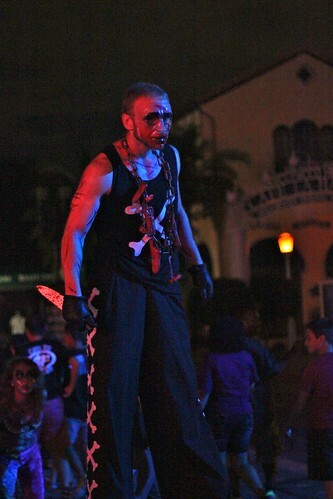 One stilt walker features crossed bones on his chest and a scar on his forearm that reads “HHN.” Another looks like he’s wearing an oversized Beetlejuice suit. 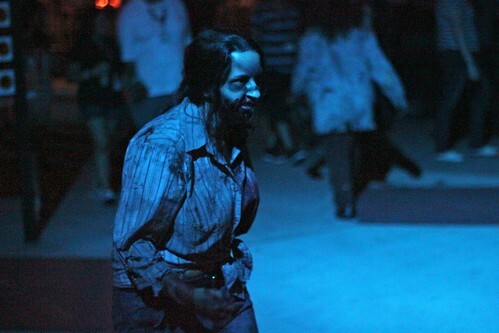 Despite the last-minute nature of these two new Dark Legions, it’s clear Universal is making an effort to increase the scares in the new street experience this year – and it’s working. 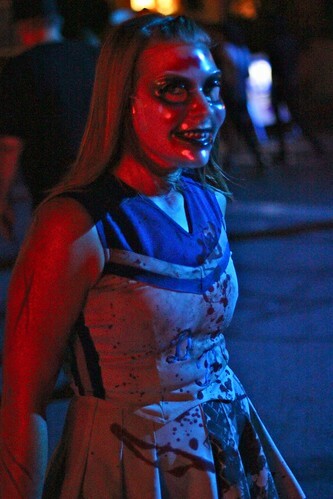 In the two nights I watched these new groups in action over this past weekend, I saw plenty of scares, screams, and guests running away from these bizarre characters. It’s the actors, not the costumes, that is making these groups work, putting their all into what little they have to work with in terms of theme and design. 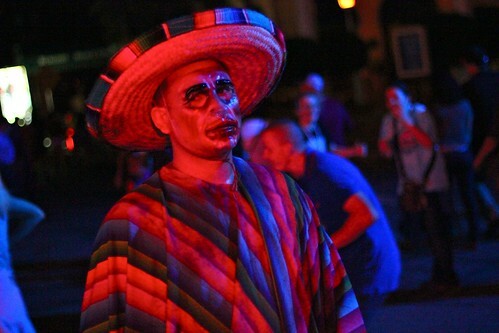 The new characters aren’t exactly original or inventive, but they are achieving the goal of providing more entertainment to Halloween Horror Nights attendees than in weeks past. And with the weekends leading up to Halloween being the most busy, even sold out on some nights, any additional characters the park can scare up are a good thing.